There is a quiet war being waged between newly arrived Olympic athletes and members of the games support staff. At stake? 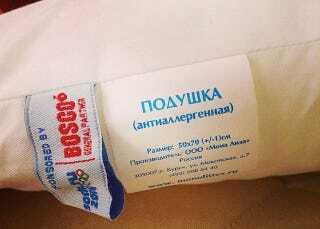 The precious few pillows extant in Sochi. Due to an extreme shortage of pillows for athletes who unexpectedly arrived to Olympic Village in the mountains, there will be a transfer of pillows from all apartments to the storehouse on 2 February 2014. Please be understanding. We have to help the athletes out of this bind." The fact that any athletes' arrivals were "unexpected" is troublesome. But this seems to be where we are: volunteers being forced to give up their pillows so that the athletes can have something resembling a good night's rest. (Luiza's Instagram hashtags are the best, by the way. On the above post she tagged her photo with: #Sochi2014 #Olympics #OlympicCamp #OlympicVillage #ManyAthletes #PillowForEveryone #TakingPillows #CantSleepWithNoPillow.